A glimpse into the yarny life of me and my cat. Wow, what a week! SO much better than last week 🙂 The sun made an appearance again and helped dry up some of the ick left over from the weekend and it is a glorious, cool and windy fall day. I am thrilled to say I’ve accomplished a lot this week. Or at least it feels like a lot. I finished up my Malabrigo Scarf and I love it! I’ve never put tassels on anything before but I think it’s a nice touch. 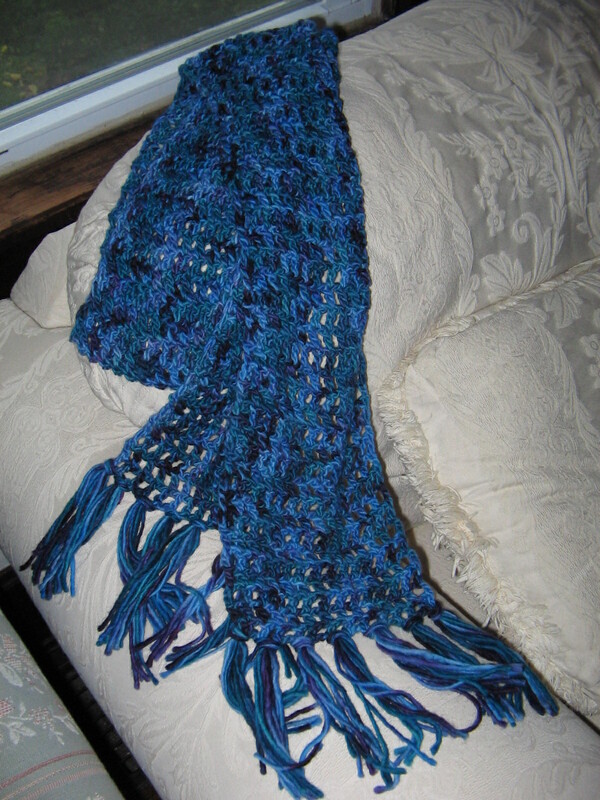 With the exception of about half of the tassels, I finished the whole thing with just one skein. So I still have one left to do something with! Hmmmm, the question is what to make. 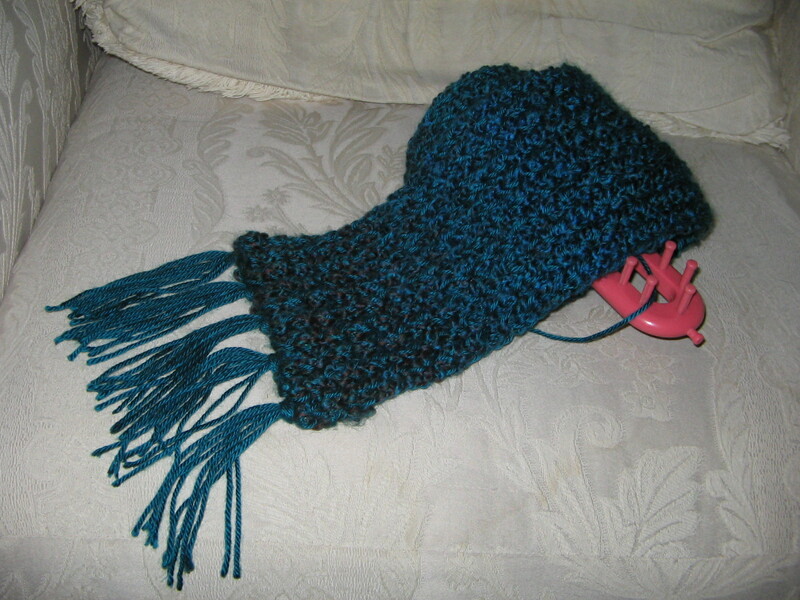 I also started and am just about finished with the matching scarf for the hat I just finished. It's all wrapped up around the loom (the pink thing). I do up my craft fair hats/scarves on knitting looms mostly. My stripey scarves are double crochet though. They work up quickly and easily that way. I think I might be starting yet another scarf in the near future in the red Cascade 220 I was given a while ago. I need some red in my own personal collection! A cute little ruffly pattern sounds nice after all of the blocky straight lines I’ve done lately. What do you think of this pattern? I just love Ravelry! Their pattern search is amazing! If you’re a crafty person and haven’t checked it out, I HIGHLY recommend it! Oh, and on a separate note, I got a new co-worker this week. I’d like you all to meet Jocelyn. She loves to be held and have her back rubbed. This Wednesday, she was delivered to my desk by one of our clients and there she now resides. 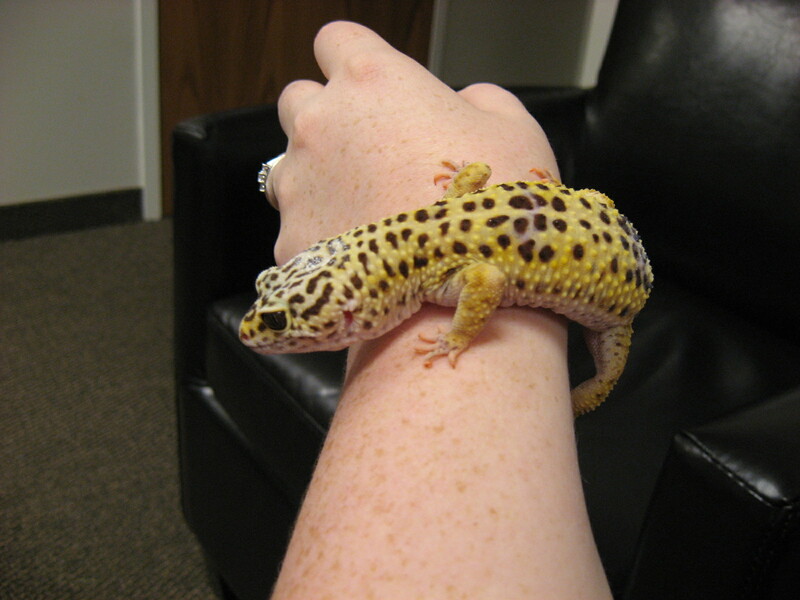 The client needed a new home for her leopard gecko (already named Jocelyn) and my dad said we’ll take her for an office pet. Much cooler than fish in my opinion! 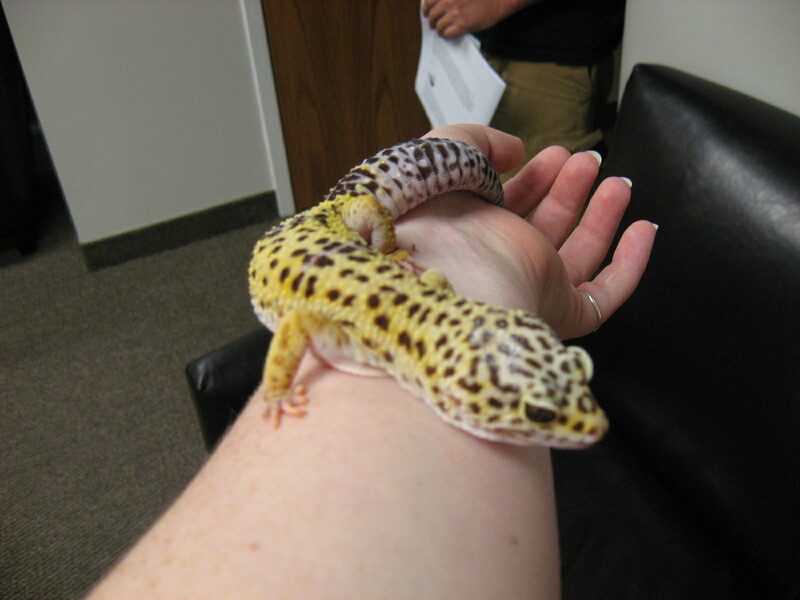 She’s a friendly little thing and really rather soft (well, as soft as reptiles can be considered). 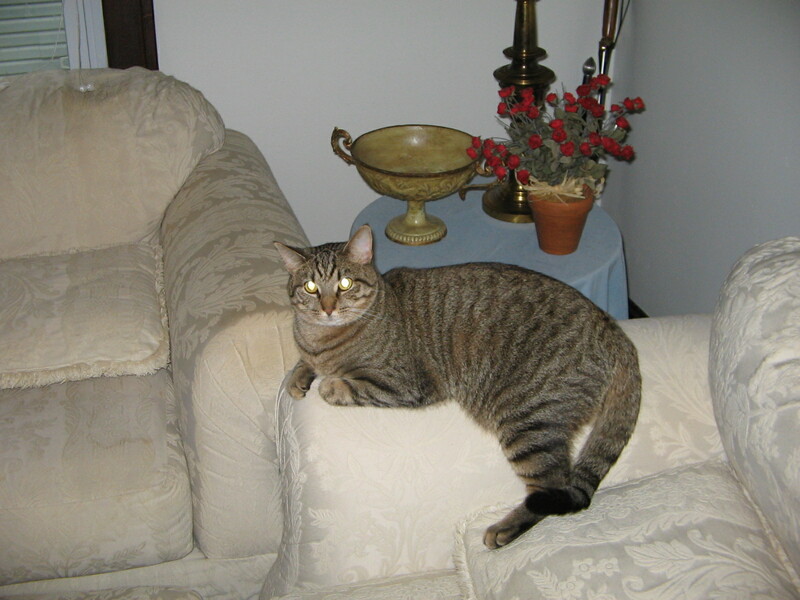 Her fat gray tail is silky compared to the bumpier yellowness of her body. You can see her tail better in this one. It’s fun to watch her crawl around while I’m working and it’s fun to get her out and show her to the children that come to our office for counseling. What’s not fun is her diet. I need to deposit one dozen live creepy crawly crickets into her terrarium once a week. Blech! I’ve never owned a reptile before so this is new to me. 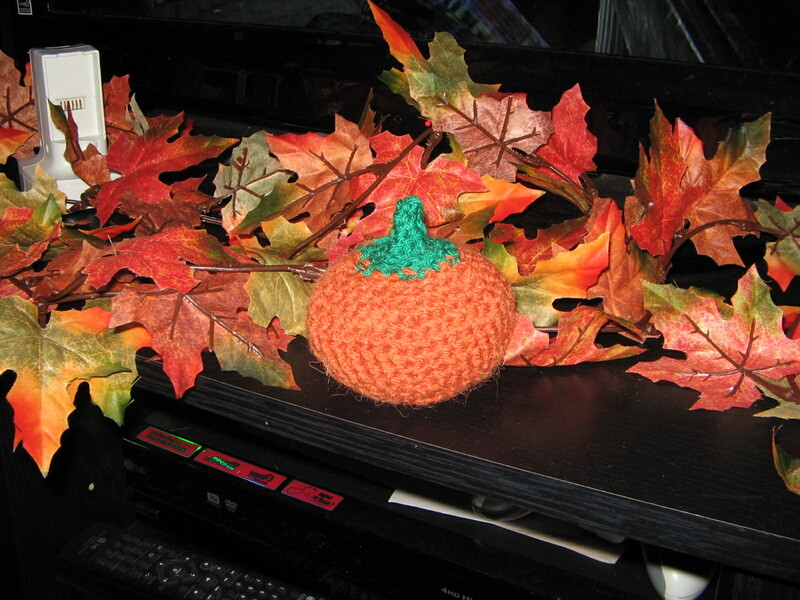 Back on a yarny note, Mina discovered where my little pumpkin has been residing. I was hoping that any decorations I hook up would be safe. I guess I should have known better!When I get home from work, there it is. Lying on the floor of some random room, and never the room it’s actually supposed to be in. Go figure. I’m never home to catch her and teach her that she’s not supposed to do that. And just like any child, she only misbehaves when I’m not around or she thinks I’m not looking! Sneaker little booger…..
That about wraps up stuff for now. Bryon and I are looking forward to a fun weekend with some of our friends so I’ll be back to share about that later! Wow, one heck of a week. I won’t lie, it started rather crummy. Between getting a nasty cold and having the transmission in my car land it in the shop for a few days, I was desperate for the weekend by the time it rolled around! Friday began and things got better. First things first, autumn began! That alone makes things better 🙂 The weather is crisp and cool and the leaves are beginning to fall. Seeing as my car was in the shop until Saturday, Cassie was kind enough to loan me her car for all of my errands on Friday and we went out to Kroger to pick up some snacks for our bi-weekly Yarning. Pumpkin cookies, apple cider, and cinnamon sticks ended up in my kitchen! 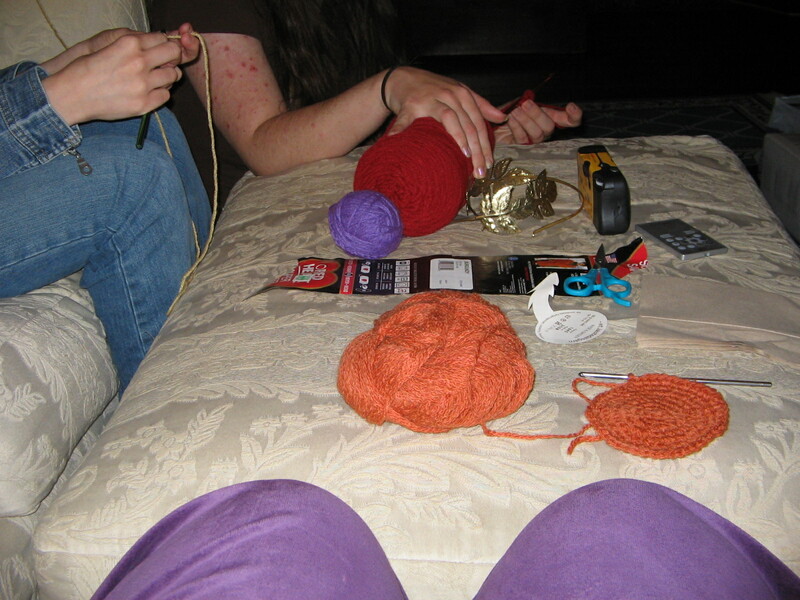 Evening rolled around and me, Cassie, and Alethia sat down with all of our goodies and our yarn! Ah, to sit and enjoy some quality hooky time with good friends. And guess who came to join us? Bryon brought his latch hook in and decided to join in our yarny fun. And just beyond him Mina decided she needed to at least sleep in the same room. Heaven forbid she get left out! One big happy bunch! 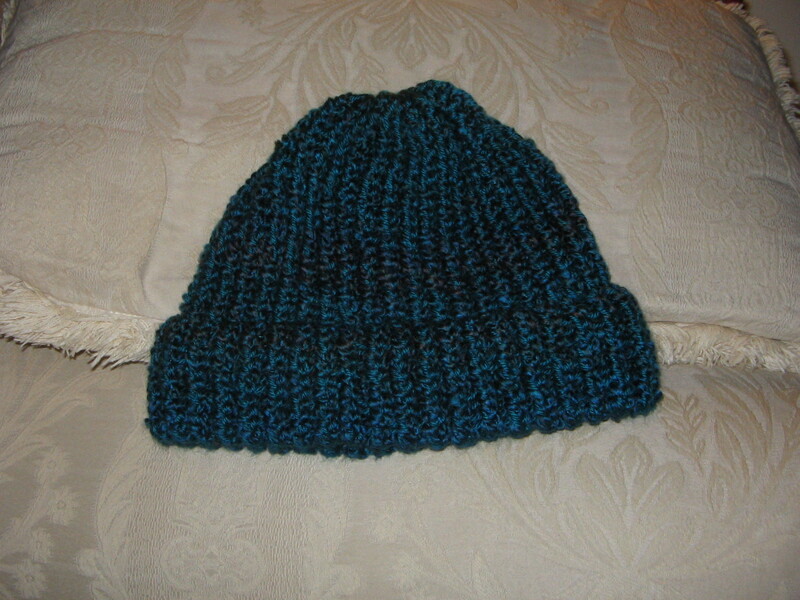 I finished the craft fair hat I was working on while we chatted. Ok, so it’s a hairy pumpkin, but it’s a pumpkin nonetheless! 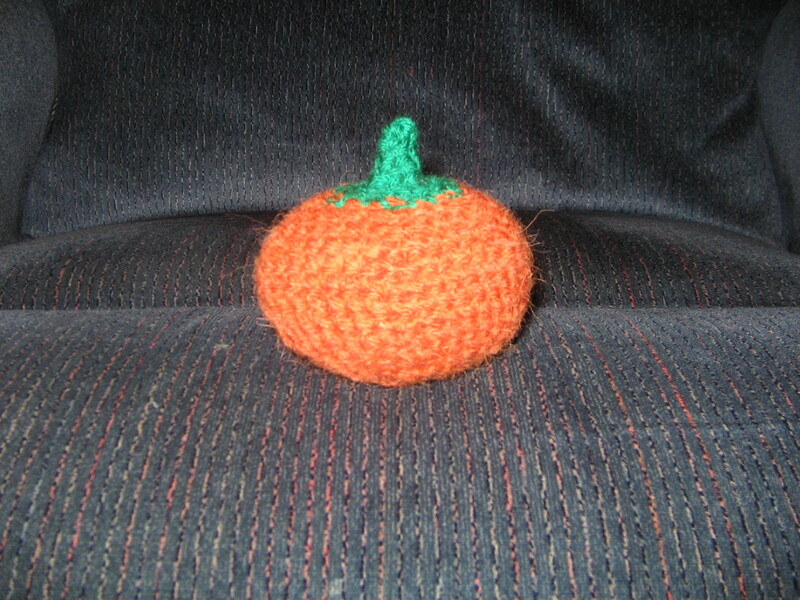 I was thrilled to remember that I did have some orange yarn on hand. 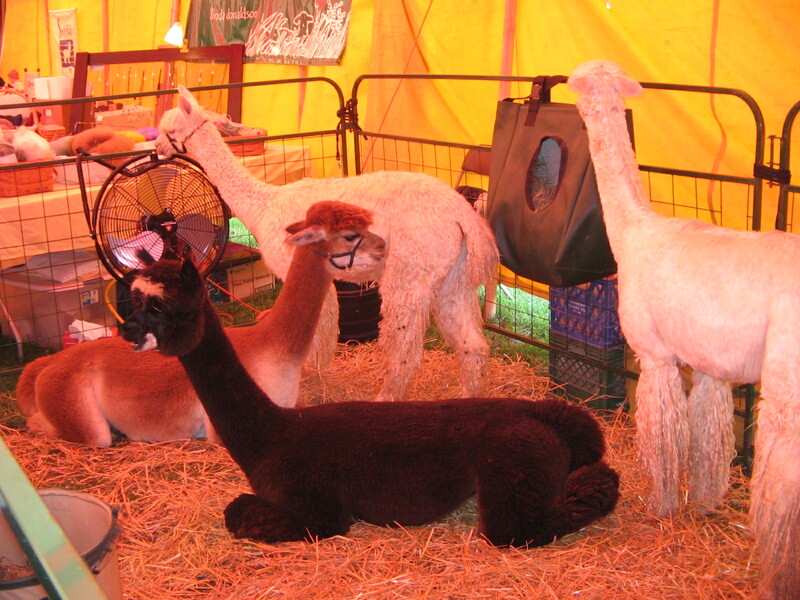 It was an alpaca blend from a yard sale I snagged up. 12 balls of the stuff for 2 dollars total! I didn’t have any idea what I would ever use it for, but what do you know? It came in handy! I could probably get three or four of those fun little things out of one ball. I definitely see more sitting around my house in the near future. Thanks Teresa! 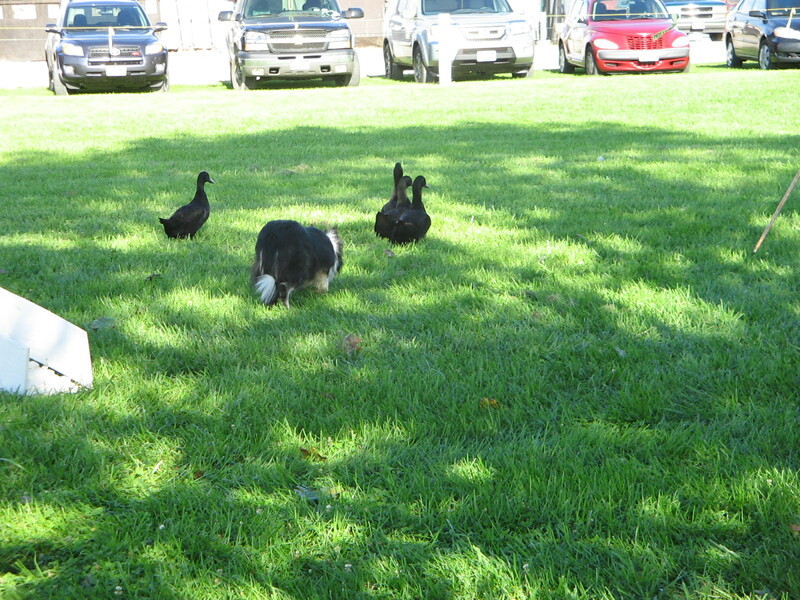 Then last night Bryon and I went to visit some friends for dinner. Michelle cooked up some tasty fiesta spaghetti for us and we had some Hershey pie for dessert. We also got to spend some time with their handsome 8 month old, the tiniest little puff-ball of a dog, and a darling little kitten. All in all, a good weekend if I do say so. Now the sun is setting and Monday is starting to crawl its ugly way toward me. I’ve got hooky business to attend to and laundry to finish up. Good luck with your week and I’ll see you all later! Well the weekend is coming to a close and I must admit it’s been a productive one! Not only did I have a fantastic time yesterday, but I got a lot of hooky time in too! Are you ready? Here it is! Taa Daa! Thanks to my mom for posing for me 🙂 Isn’t she lovely? She bought a cute wooden shawl pin when she was at the yarn shop last weekend with my grandmother (the same one where they bought my dog-sitting payment). You can check my Ravelry page for details. I’m so glad it’s done! Really simple and fun to work through, just a smidgen monotonous after a while. She wanted to keep the wonky fringe instead of blocking it out. Now to start something new! I now have a hat started to go into my pile of hats and scarves for sale. There are a few various craft shows here in town, and one of them takes place in the conference rooms of the hospital. Last year was my first time visiting and I had a great time looking around and seeing all of the neat and beautiful things that people created. I decided I’d like to become a part of it if possible so I am building up a collection of knit (loom knit) and crochet scarves and hats to put up for sale! I don’t have enough to put up a legitimate booth for this year’s upcoming craft show, but next year I will! 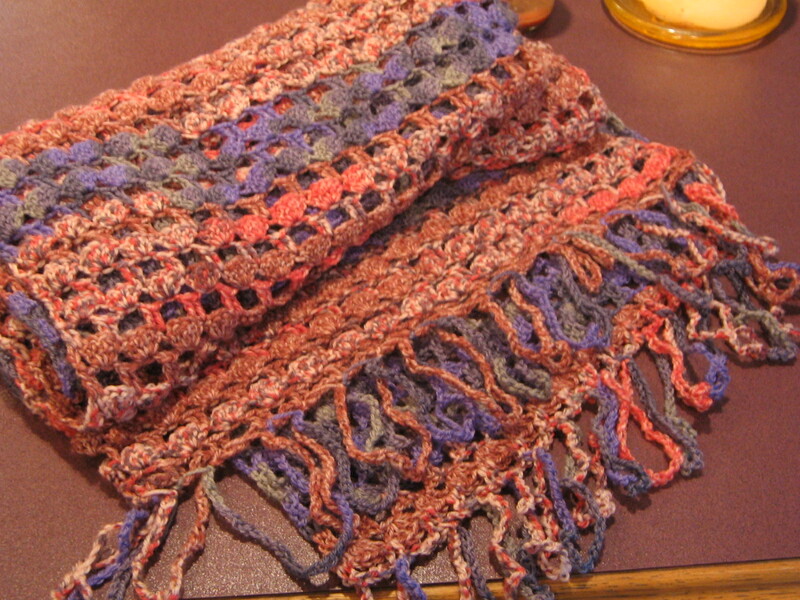 I prefer to use two yarns to help give the loom knits a bit more substance. My collection needed some blue. Seeing as it’s one of my favorite colors I’m surprised it hasn’t made its way in yet! I also started a project for myself today. 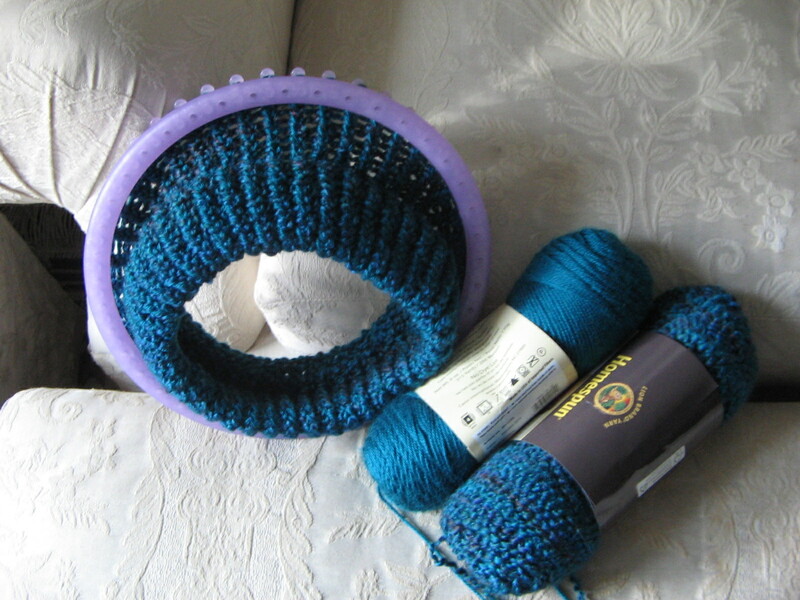 A while ago I bought some Malabrigo Worsted yarn from Sheri at The Loopy Ewe and decided it was time to work it up! I LOVE this yarn! It’s so unique (at least to me) in the way it is spun and the colors are so rich. When i was searching for which colorway to buy, I could barely make up my mind! I settled for Whale’s Road. I will certainly be buying other colors in the future! If you haven’t used Malabrigo before, I highly recommend it! 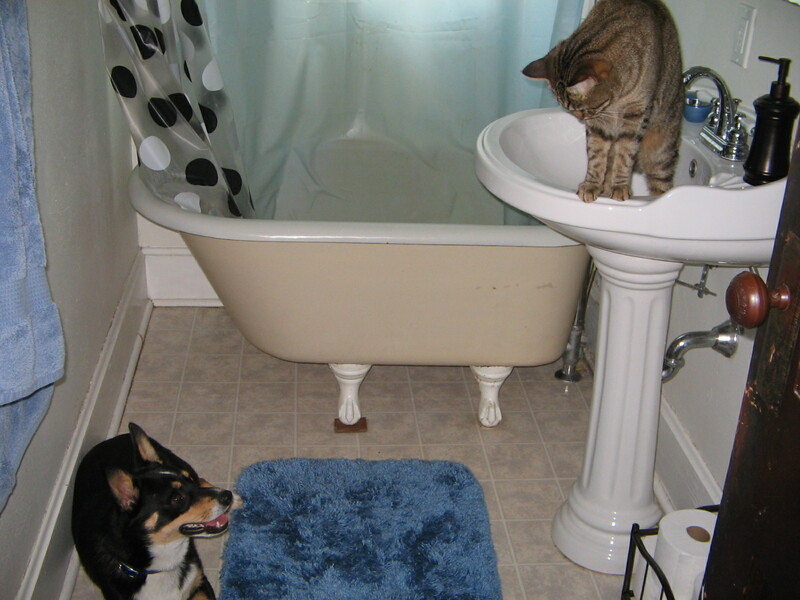 Apparently Mina likes it too…. Cute and innocent right? Wrong! Little snot still doesn’t understand “No.” Alas. 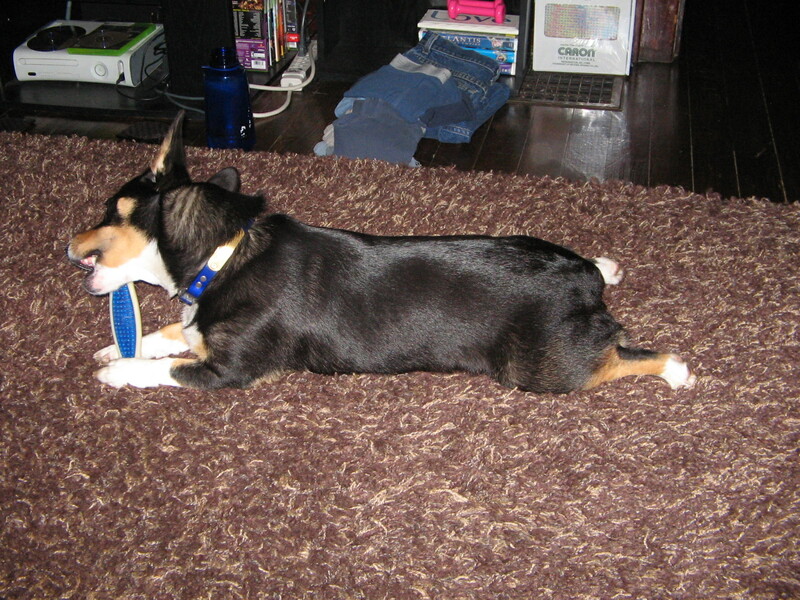 At least I caught her before she ran off with it or chewed through it this time. 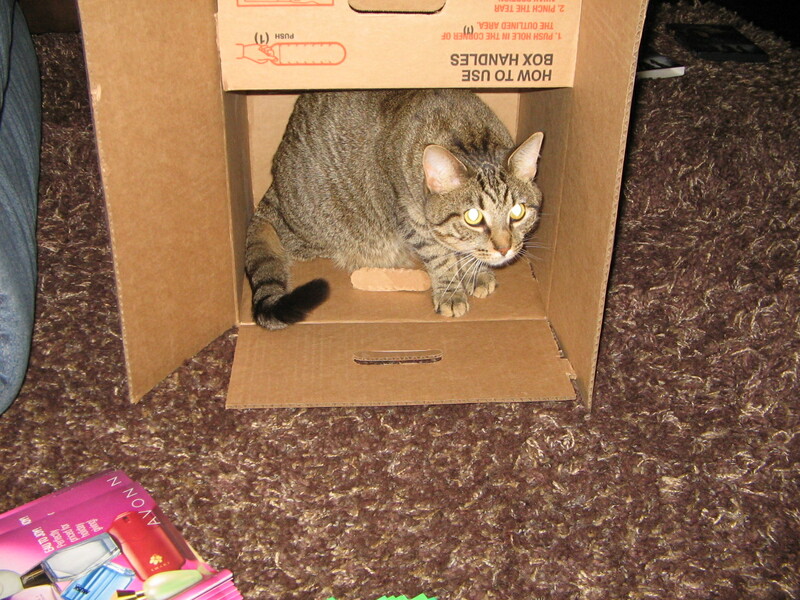 I think Miss Mew is on a learning curve. I have to love her though. Well, that’s about it for my latest adventures. Oh, I guess I did fiddle around with my needles again today and learned how to increase and read patterns a little better. One step closer to actually making something fun! See you all next weekend! 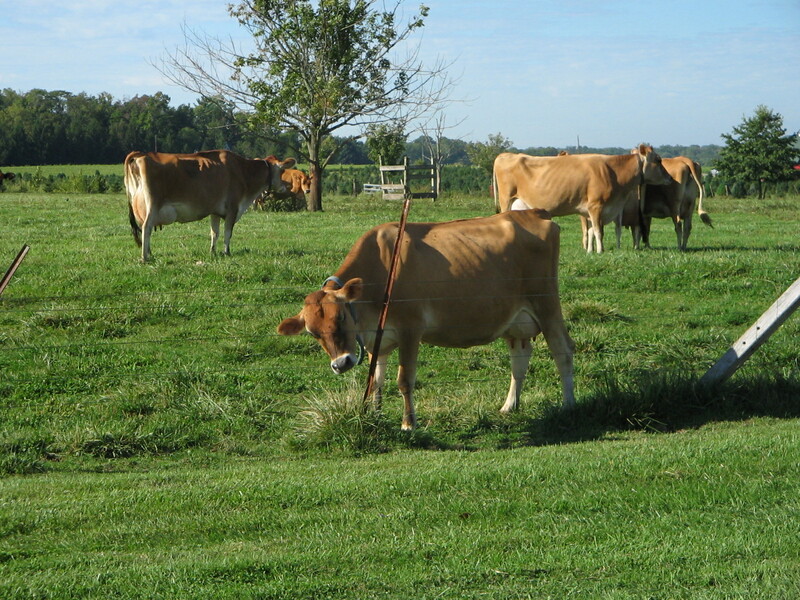 Not very woolly, but what do you expect at a dairy farm? And lots and lots of fun things to buy! A serious case of the “I-wannas” took place and I really want to learn to spin now. 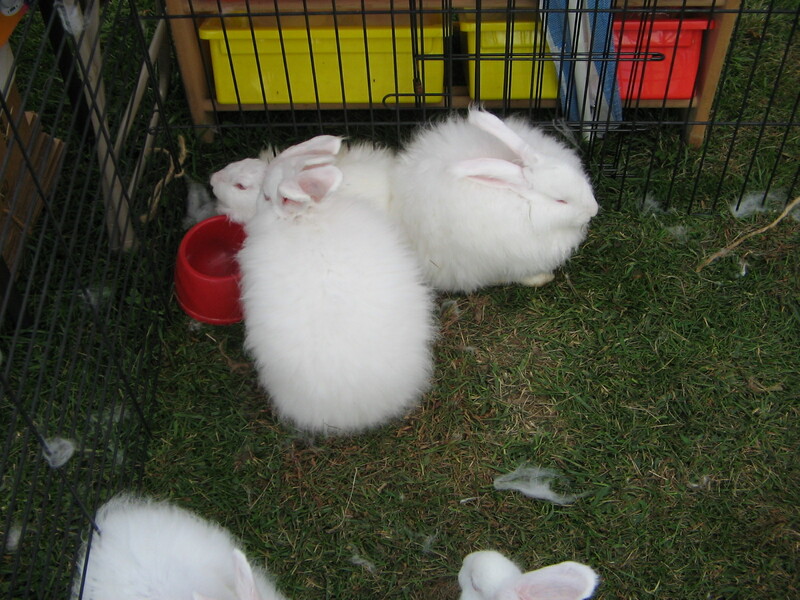 Look at all of these bags of fluff! Mounds and mounds of natural fibers! 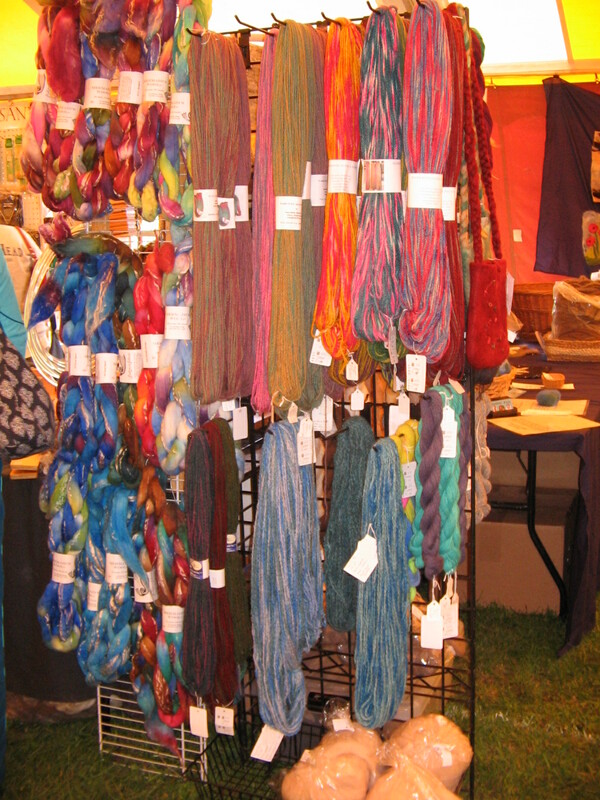 There were baskets lined up of pretty dyed bits as well from various vendors. The colors were just gorgeous and there was such a great variety! I wanted to purchase one of these to help me out with all of the pretty fibers! 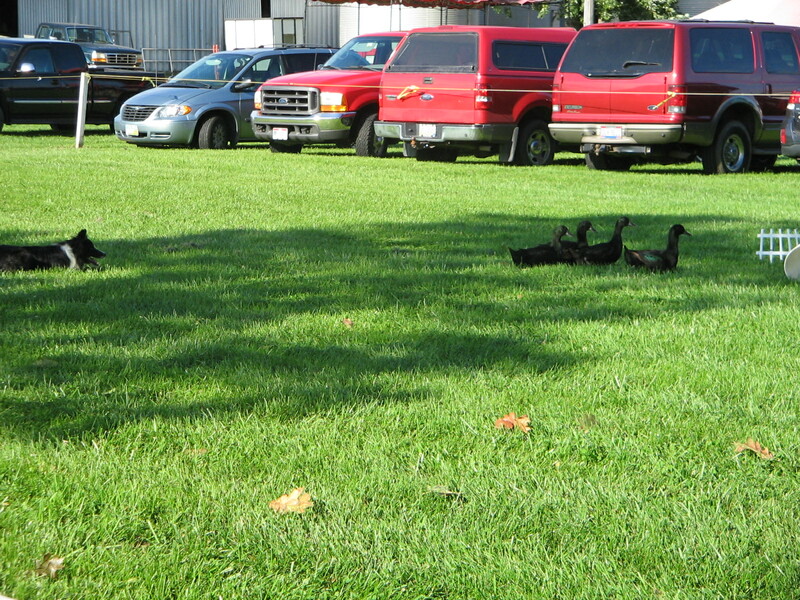 These were the larger wheels, the smaller ones were down by where I was standing. 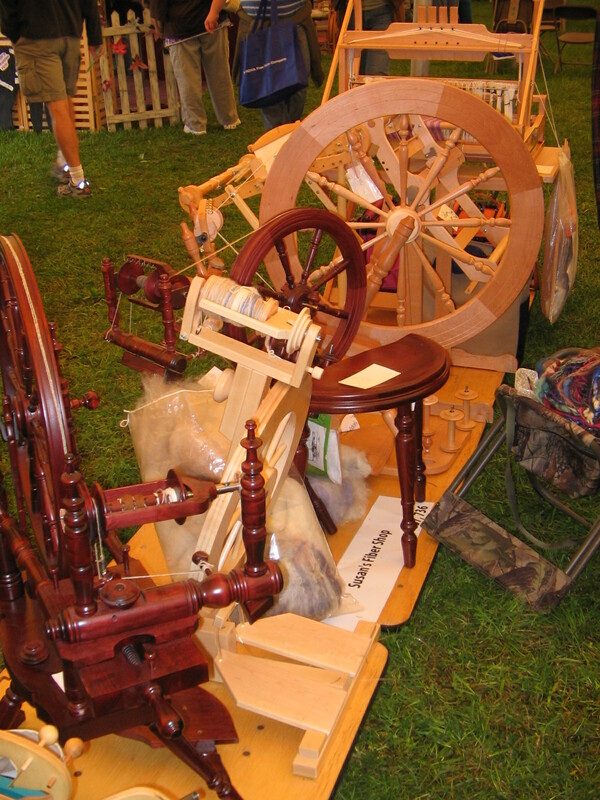 I think spinning wheels are so beautiful. They themselves are a work of art. The only trouble is I struggle finding time to crochet and knit. Trying to find time to spin would be even more of a challenge. 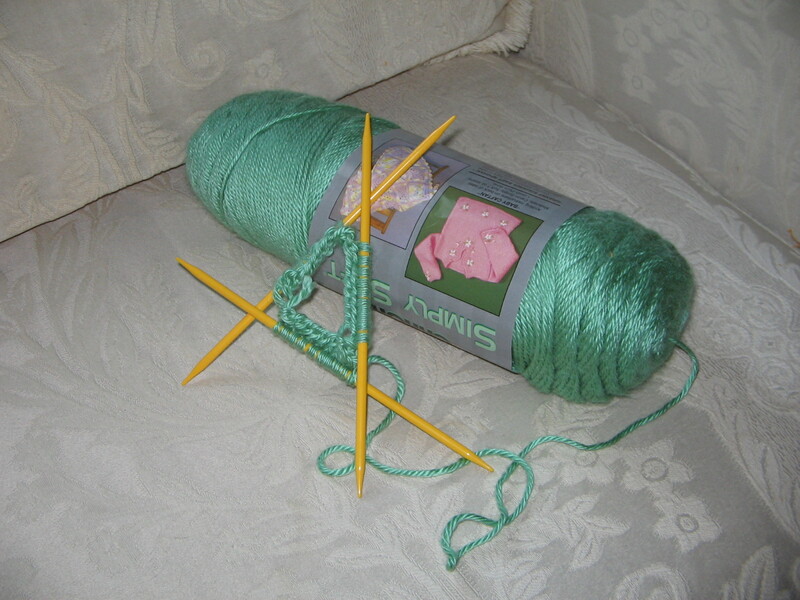 Not to mention I need to polish up my knitting before I can even think about adding in a new hobby! Some day perhaps…. 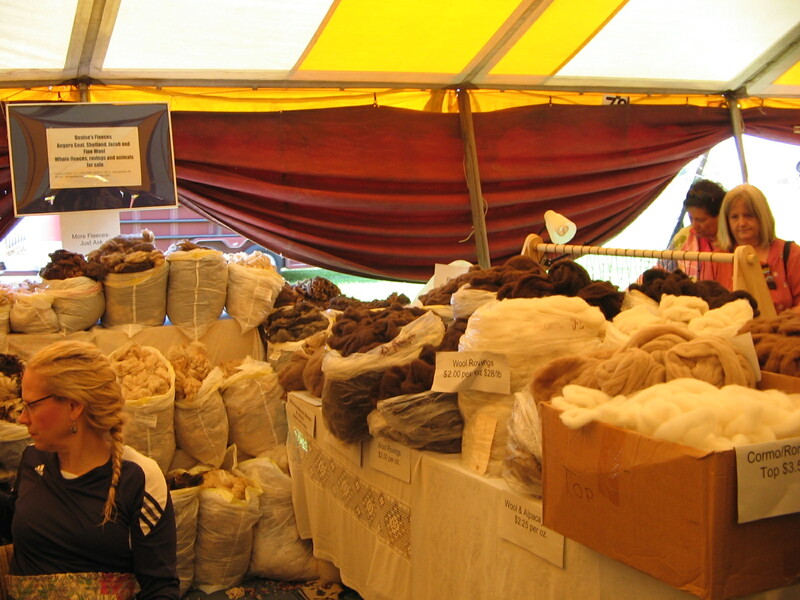 For those of us who don’t spin, many vendors had buckets/tables/shelves/racks full of skeins and hanks for sale. I’ll admit I came away with some new yarn, as did Alethia. I now have some pretty green self-striping sock yarn, some pretty red/pink alpaca that I plan on knitting into a happy gift for my dear sister, and a HUGE hank of silver/gray alpaca that I have no immediate plans for. The deal was so good I couldn’t possibly pass it up! All Bryon could say when I returned was, “That’s a lot of yarn.” Observant right? 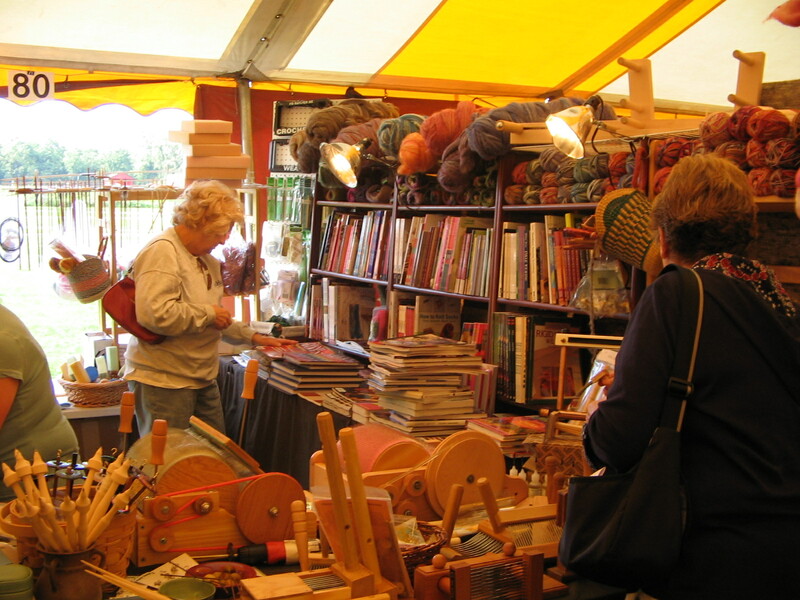 They also had every conceivable book available on crocheting, knitting, tatting, weaving, and felting. I’ve never seen so many fiber craft books in the same place at one time! 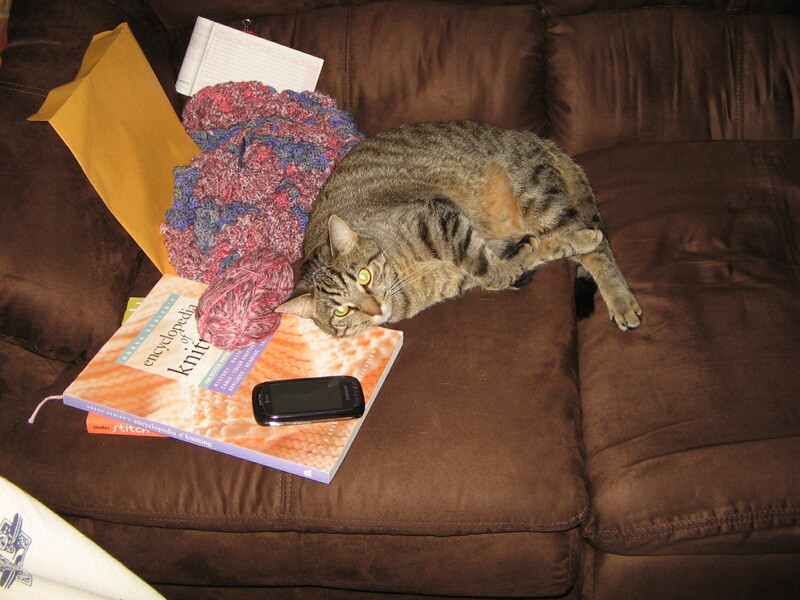 Alethia lost herself for a bit amidst all of the pages. This is just the weaving literature! 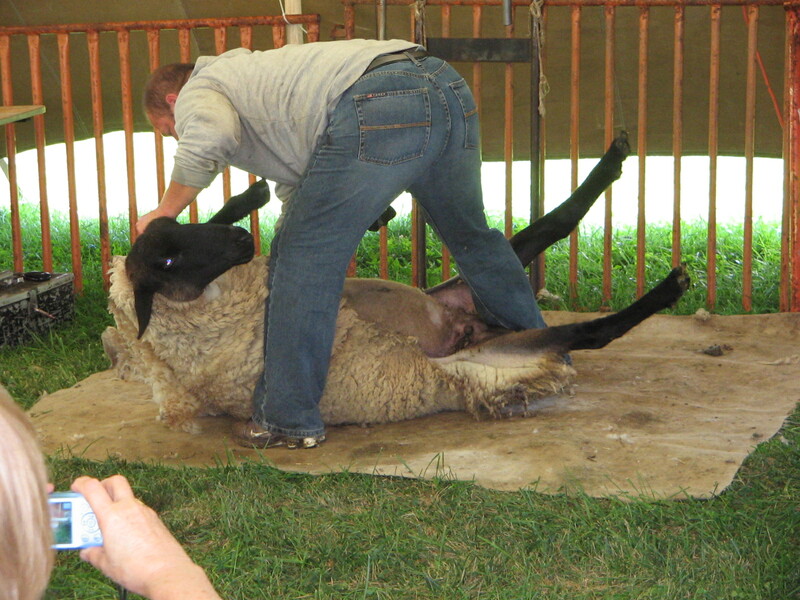 and got to see a sheep shearing followed by a Q&A. 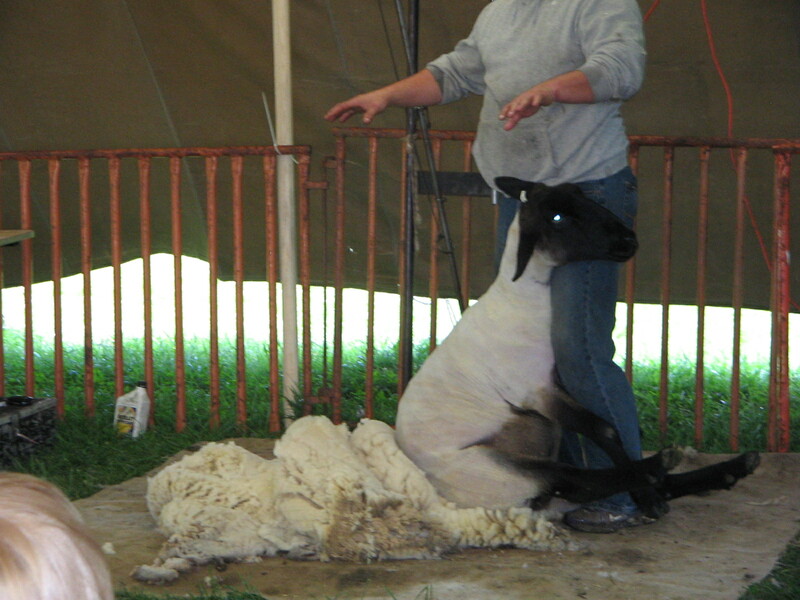 That sheep was tossed all around while he shaved it down. Th sheep didn't seem to mind in the slightest. A much neater looking lamb leaves behind a much larger looking fleece than I expected. 6 lbs! Such a busy day! 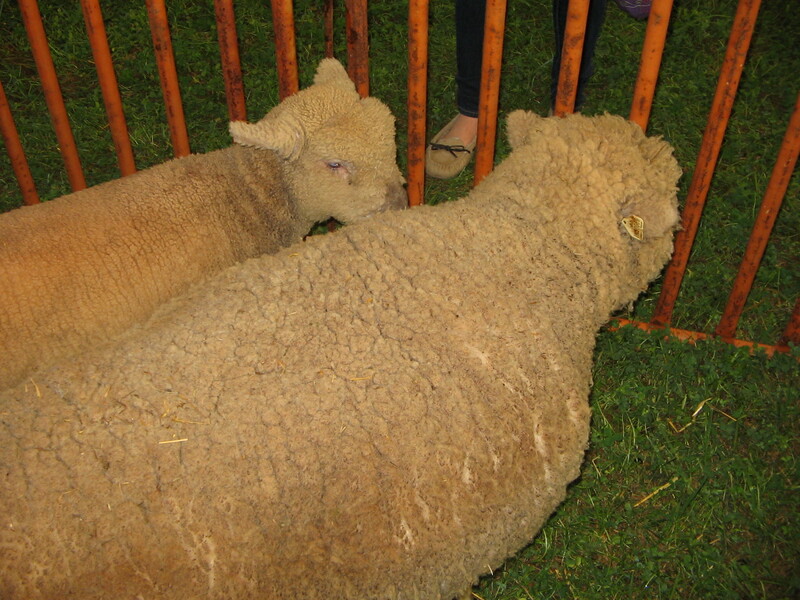 We had a great time though and learned a bit about owning these lovely animals and a lot about self-control 🙂 Now that the event has come and gone, my yarn diet is reinstated until I finish at least two (preferably three) projects. Wish me luck! It’s been a beautiful weekend and I just want to express my happiness. Last night was ultimately serene in the fact that I got to sit down with a hot cuppa (vanilla caramel goodness), a favorite movie, a gentle thunderstorm, a dog sleeping at my feet and my cat sleeping next to me, all while enjoying some quality hooky time. I was simply oozing contentment ^_^ Moments like that make all of life’s struggles melt away into insignificance. Momma and Grandma are now back home, so therefore so is Max. It sure was an experience having him over for a few days! I think we’ve come to the conclusion that even a little dog like him is a bit too big for our house. Perhaps a happy little dachshund? I dunno. We’re still waiting on the ok from our landlord to even consider owning our own dog. And don’t worry, our weekend visitor was approved before he came to stay! One of the advantages of having my own father as a landlord! He owns a few rental properties and one became available the same time Bryon and I got married so we snagged it! Some people say I’m too involved in my parent’s lives seeing as my father is my father, my landlord, my boss (momma works with us too! ), and my pastor. Weird huh? Oh well, I love my family! 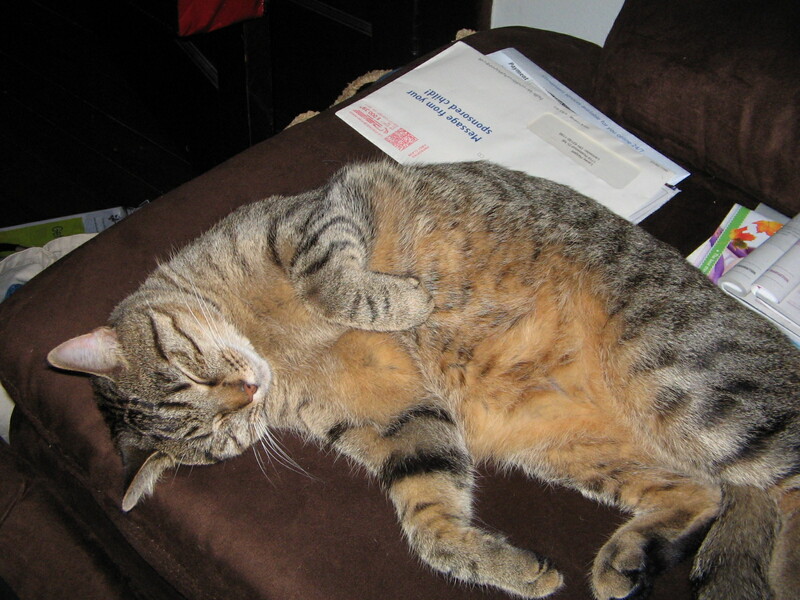 Now that things have settled in our cozy household, miss Mina can relax again. And she most certainly has. When Grandma came to pick up Max, I got a handsome little trade-in! 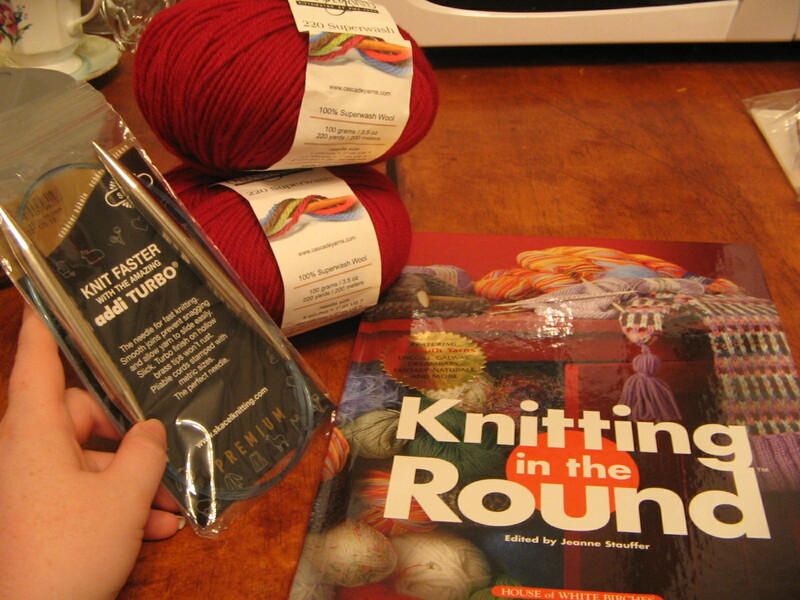 Some lovely blood-red Cascade 220, a book on knitting in the round, and some addi Turbo circulars. I love that kind of payment! Wooo! Bryon got paid too, but mine is so much more fun 🙂 Thanks Grandma! Looking forward to playing with my new toys! Off I go to prepare for a new day now that this one is drawing to a quick close. Goodnight or good morning, wherever you are! Ten years ago I was in my ninth grade Spanish class when another teacher walked in and whispered something to my teacher. We could all tell something was wrong. When I walked into my math class after Spanish, all schooling had ceased and all classroom televisions were set on the news. 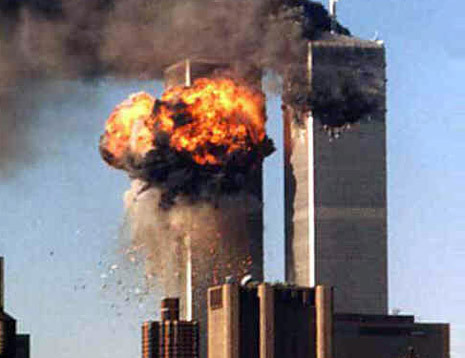 We all watched as the second plane hit the second tower and saw them crumble straight down in a pillar of smoke and ash. We were sent home early from school when we heard there was another plane headed for Washington D.C. The rest of the day was spent huddled with our families around the television and the phone waiting to hear that loved ones were safe and the attack was over. To all of those immediately affected by that tragedy, God bless you and keep you. Thank you to all who served and fell and those who survived and continue to serve in the NY police departments and fire stations. 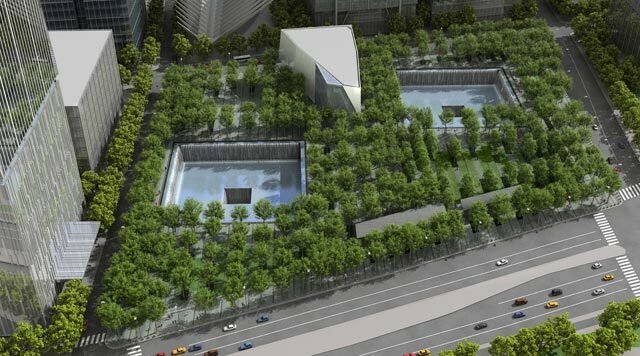 Your bravery and sacrifice will never be forgotten. It’s been a good week here! Fall suddenly appeared, I finished my star stuffie, I’m almost done with momma’s shawl, I finished a pretty little gauge swatch with that shiny blue Astral alpaca I bought, I had a GREAT time with some of my girlfriends yesterday evening, time to cook up yummy means, and Bryon and I are dog-sitting for my grandmother this weekend. Busy but good! It’s done 🙂 Didn’t take long, but still satisfying to complete a project. I could’ve filled the tips in a bit more, but not bad for making my first stuffie/softie. It’s quite cuddly. I get to show it to the lady it was made for tomorrow so I’m looking forward to that. 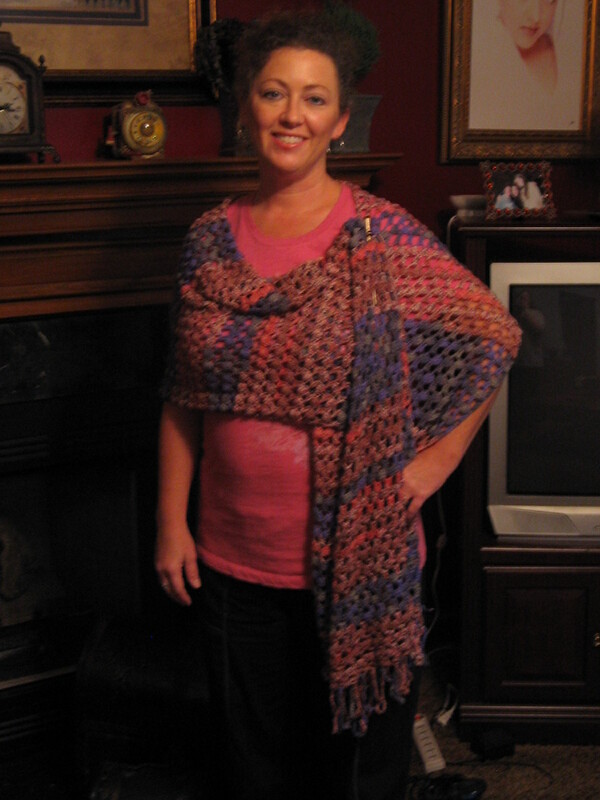 No more chattering about that crazy shawl till it’s done so that’s that. The little swatch worked up quite nicely but the color looks different. 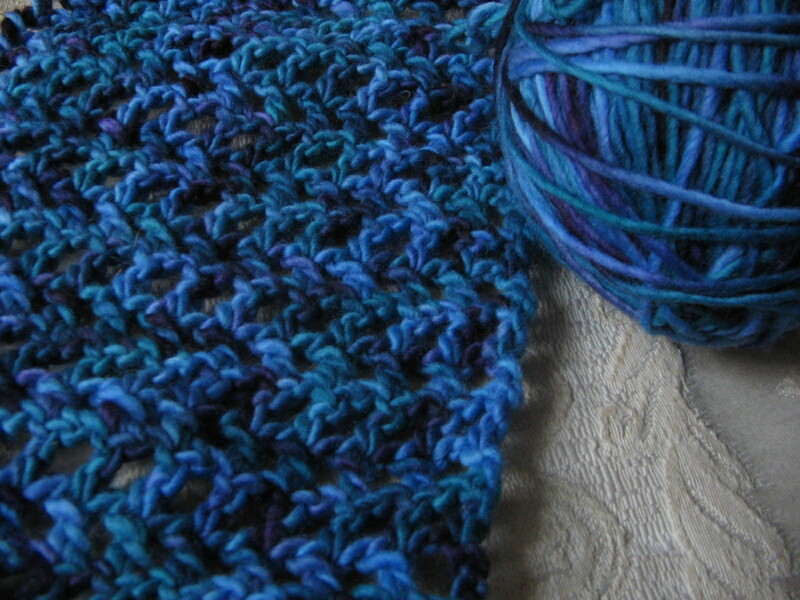 It’s actually a bit darker when it’s all knit than it seems when it’s just in the hank. No worries though, still pretty and soooo soft! I can’t wait until I start/finish those arm warmers I want to make! They will be amazing if I do them justice! Me and a few of my girlies started getting together to do fun yarny activities a couple of times a month and we just started meeting. Alethia is a competent knitter and crocheter, Cassie recently started crochet, Sara Lynn is new to any and all things yarn, and well, you know where I am. I’m teaching Sara Lynn to crochet and Alethia is helping me with my knitting skills while Cassie is content to sit and hook her own little heart out. Poor Cass had to work last night, so us other girls met at Sara Lynn’s place for dinner, tea, and yarn! What a blast! It’s always good to have a girls’ night out. Not much was accomplished on any projects, but I think that’s permissible since it was out was out first gathering and the other two girls hadn’t seen each other in 8 or so years. 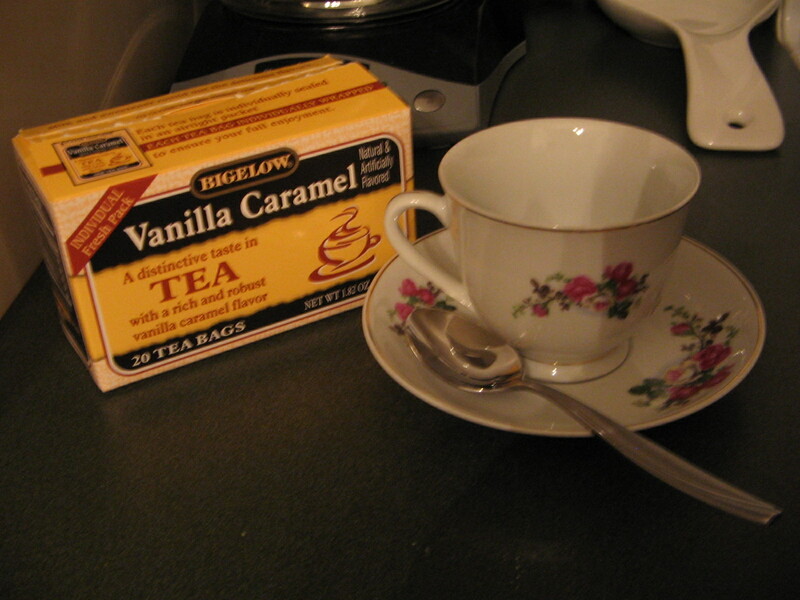 It’s so nice to chat with good friends over a hot cuppa! Fair right? PS- Monk’s Blend from Aunt Sue’s Tea Room is highly recommended! That takes us to dog sitting. Let me start with this. Happy peaceful Mina. Ruler of the roost. Poor Mew. Needless to say he took off after her and still does from time to time. 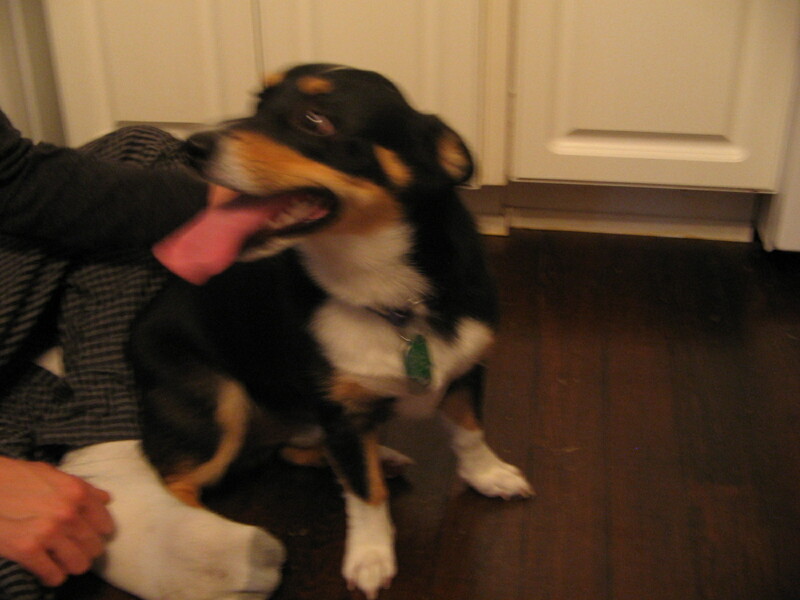 He’s a Welsh Corgi and is a real sweetheart. 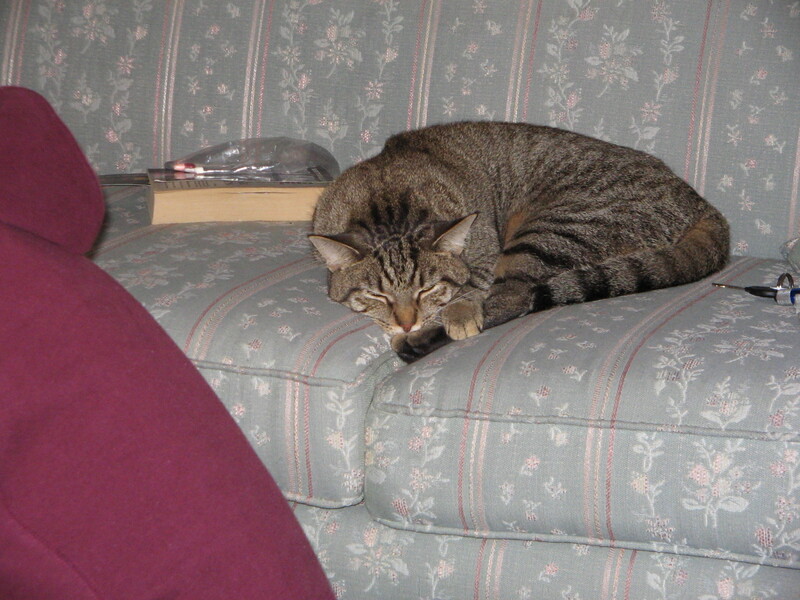 After about a day here he finally settled down enough that he and Mina are able to relax in the same room together. 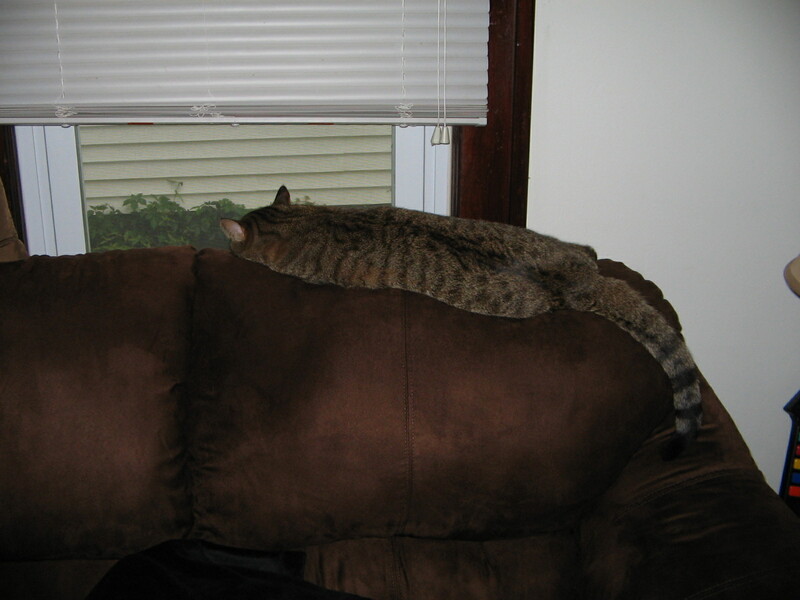 That is, until she decides to move, then all heck breaks loose. Se la vie. Bryon gets to pretend he’s a dog owner for a few days so he’s happy. It’s about that time folks. Off to walk Max one last time and settle down for the night. Hope you all enjoy the rest of your weekend! Thanks for visiting! Well, today has been one of great accomplishment for me. Nothing major happened, but a lot of little things were done 🙂 My grandmother’s auction finally took place so I spent the first part of my day down in Greenfield bidding on items with the rest and spending time with friends and family. I procured several fun little items to add to my teapot/cup collection and to help decorate my sad-looking front sitting room. I love the blue glass especially! Now I just need something to put in that bowl. Suggestions? 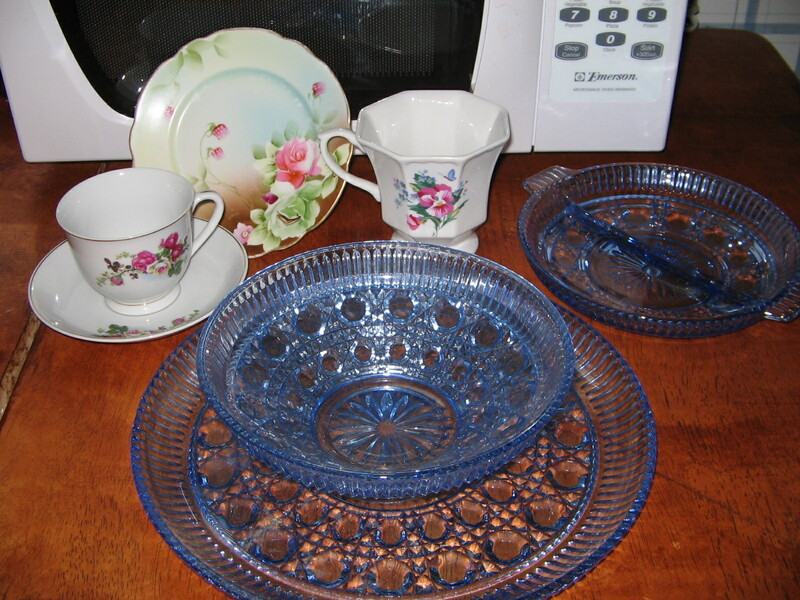 I like all of my new little purchases and I got all of it (2 teacups, 2 saucers, matching glass plate/bowl/divided platter, vase, two pots of flowers, and a deceptively heavy decorative bowl) for under $20. 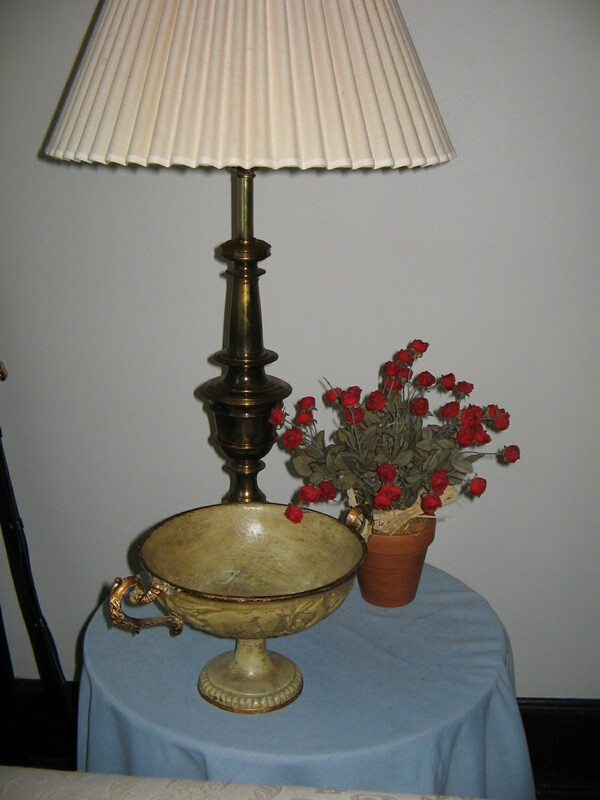 I don’t know what the heck the decorative bowl is made out of, but it has to be some kind of metal. Grandma did pretty well for herself too, which was the whole point of the auction. Finally came home and got to work on my yarny fun! A few more rows on momma’s shawl (this thing is crazy long, but she said to use ALL the yarn she bought) are complete. I also got some more practice in on my DPNs! I should have chosen a different yarn to practice with though, this one is too splitty. It’s too small to actually be anything, but I’m just considering it to be a kind of circular test swatch. That works right? This was obviously taken before I got to add my practice from today. Thanks to Angie to letting me borrow her DPNs until I get my own! She's the same lady who taught me how to knit in the first place. Alethia was over for yarning and taught me how to work in the round. Yay for new skills! She also loaned me her knitting encyclopedia. I greatly appreciate the borrow and buddy system that me and my friends have with our materials. 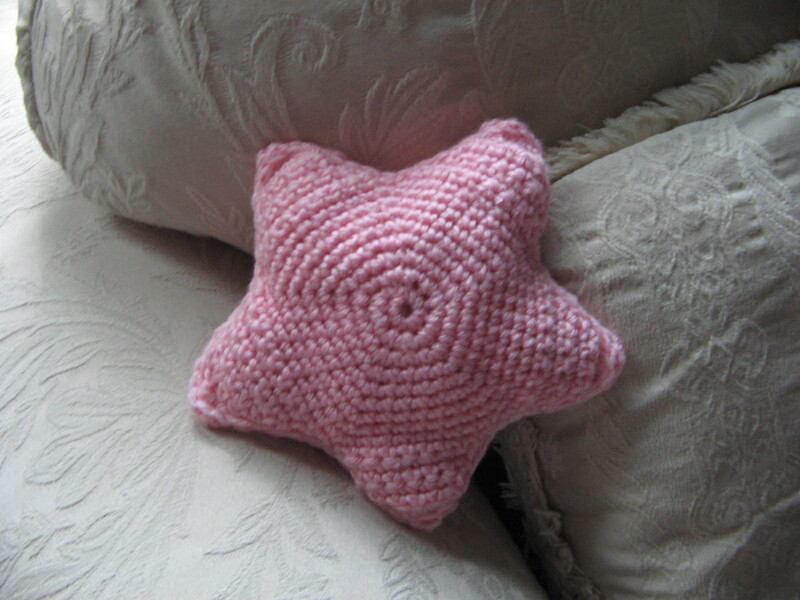 Along with that practice, I almost completed my Star Stuffie today. I chose pink for one of my friends who is a breast cancer survivor. Every year there is a Relay for Life fundraising event at the local fairgrounds and she has a team that participates in order to help raise funds for breast cancer research. Her team is called the Stars of Hope so I wanted to make a little stuffie for her! I found the pattern courtesy of April Draven’s blog. I got the second star worked up all the way to the last three rows of the last point and ran out of yarn! Gah! Soooo, I have to head to JoAnn’s tomorrow to pick up more pink along with some poly-fill for the stuffing. When I ran out of yarn, I could’ve sworn I had a little bit more pink leftover somewhere in my stash that might have matched. So what did I do? I dug out all of my yarn from its various locations. In the process of looking, I discovered that my various yarns were higglety-pigglety and I had no idea where everything was. Some of them where still in their original purchase bags! 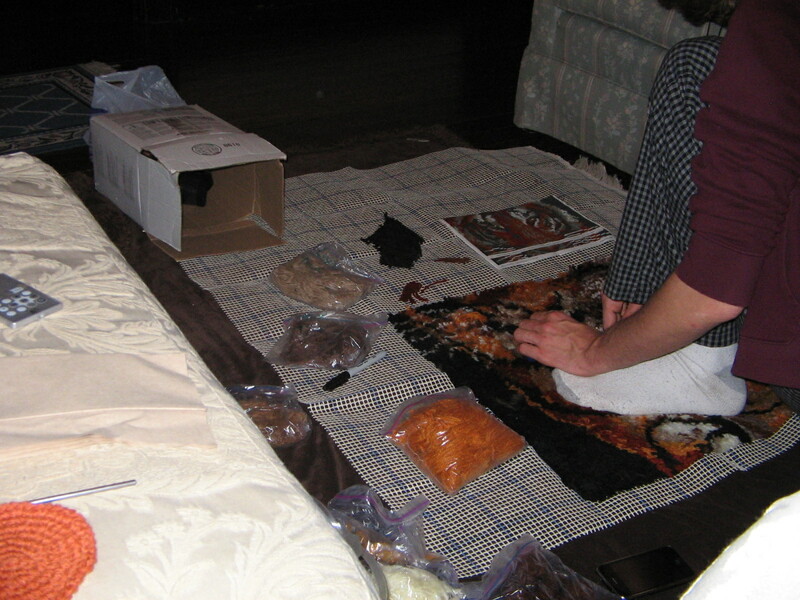 Bryon came home from a trip to the store and found me sitting on the living room floor surrounded by two empty containers and skeins, balls, supplies, and patterns. I finally got all of it organized and feel much better about the whole thing! 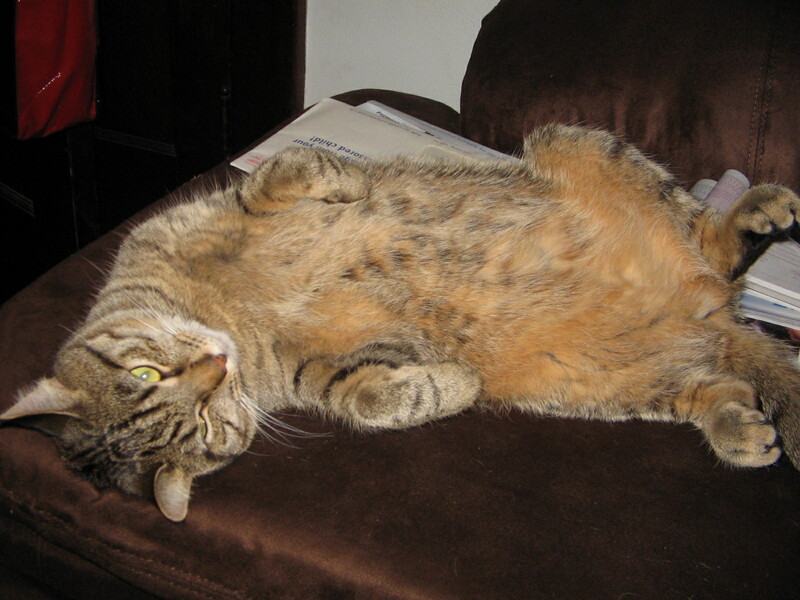 So, finishing out the day with the blog world and a movie with my beau. Looking forward to a long weekend since Monday is out for Labor Day. I hope to have some more done by then! Good evening from me and Mina!